from a rich breakfast offer with fresh-baked pastries, to the delights of a fine dinner. Just 500 m from Piazza Righi, the stylish heart of Madonna di Campiglio, the Alpen Suite Hotel is the ideal starting point to savour fully a vacation in the Brenta Dolomites. From the hotel guests can easily reach the main attractions of the area: Castel Thun (55 km), Lake Garda (65 km), Trento (70 km), Rovereto (95 km) and Bolzano (125 km). An impeccable 5-star hotel with a warm family atmosphere, the Alpen Suite Hotel offers its guests a regenerating experience marked by mountain delights: the style of wood and precious soft furnishings, the crackle of logs in the fireplace and the glamour of the lobby bar, the irresistible food attractions and the cosy comfort of Alpen Wellness. Simple and stylish, the hotel’s 28 rooms are furnished with wooden pieces and soft colours inspired by surrounding nature. All rooms have a king-size double bed, free Wi-Fi connection, TV with International sat channels, SKY Gold, small safe, minibar, en-suite with either tub or shower, hairdryer and courtesy toiletries. The hotel’s wellness centre is an intimate welcoming space dedicated to relaxation, where guests can live a regenerating experience for mind and body. It offers free use of: a pool with counter-current swimming and a hydromassage tub, a Turkish bath and Finnish sauna, an emotion shower and ice mountain. Spa manager Raffaella, an expert in natural treatments and mountain lover, will be happy to suggest special treatments and massages, available with payment of a supplement. The two large rooms of the Convivio gourmet restaurant offer guests an intimate, stylish welcome: there are seven tables in the Hofer room, with its oak panelling, fabric insets and mirrors; and there are four tables in the small stube, heated with a traditional tiled stove. Guests can choose between an à la carte menu and a tasting menu, both offering stylish reinterpretations of local traditional food. Informal and appealing, the Bistrot of the Alpen Suite Hotel offers an à la carte lunch menu (12.30/14.30), a tasty choice of snacks and quick dishes (14.30/19.00), and an irresistible gourmet menu for dinner (19.30/22.00). Every morning, the hotel serves a delicious breakfast, with bread, biscuits and pastries hot from the oven, and a rich buffet with local seasonal products and specialities (07.30/10.30). The cost of your stay includes free Wi-fi connection throughout the hotel, access to the wellness area, parking space in the garage and a shuttle bus service to the ski lifts of Madonna di Campiglio. Payment of a supplement ensures a laundry service, massages and beauty treatments at the Alpen Beauty Spa. Small pets are allowed in some suites only (on request), with payment of € 18.00 per day. Furnished with pieces in natural larch wood, the Classic is a large bedroom with an open-space lounge area and a double sofa bed. The en-suite bathroom has a double hand basin, tub and separate shower cabin, enlarging mirror, hairdryer and courtesy toiletries by Etro. 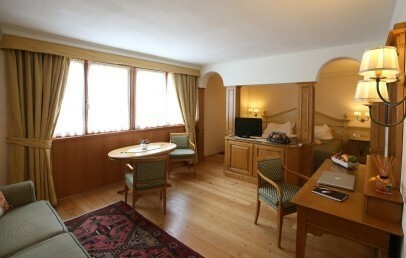 Included: TV, SKY Gold, minibar, small safe. A large room with a splendid view over the Brenta Dolomites, this Deluxe Suite has a night area with a king size double bed and a separate lounge area with a double sofa bed. The private en-suite has a double hand basin, shower, enlarging mirror, hairdryer and courtesy toiletries by Etro. 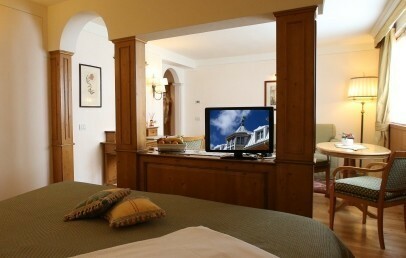 Included: 2 TV, SKY Gold, DVD player, minibar, small safe, kettle with a selection of teas and herbal teas. Welcome gift: 1 hat and 1 bottle water per room! Access to the Wellness Centre included!